Dr. Ariyan received his medical degree from New York Medical College. After a surgical internship at UCLA, he completed his training in general surgery as well as plastic surgery at Yale University School of Medicine, becoming certified by both the American Board of Surgery and the American Board of Plastic Surgery. He was then asked to join the faculty at Yale in 1976, was appointed Chairman of Plastic Surgery in less than 3 years, and rose to the rank of tenured full Professor of Surgery in another 2 years. Dr. Ariyan is an internationally known surgeon specializing in the treatment of patients with head and neck cancer, breast cancer, and malignant melanoma. He has been recognized for the origination and development of several myocutaneous flaps for reconstructions of the head and neck- most notably the pectoralis major flap, which has become the most commonly used flap for head and neck reconstruction worldwide. 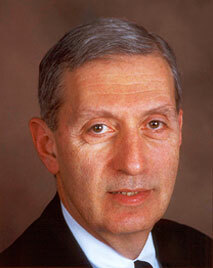 He established the Yale Melanoma Unit in 1976, and continues to this day as the Director of that multispecialty team. Following the devastating earthquake in Armenia in December 1988, he was invited by the government of the then Soviet Union to help care for the many victims. After assessing the situation, he recommended the establishment of a western standard plastic surgical unit to care for the reconstruction of the vast number of patients. He was asked to select a team of surgeons, anesthesiologists, and nurses from Armenia, which he trained at Yale from 1990-1991, with the joint collaborative efforts of the AGBU, the USAID, the ECFMG, the RRC for Plastic Surgery, the Yale School of Medicine, and the Yale-New Haven Hospital. That team has been successfully working together at the new Plastic and Reconstructive Surgery Center in Yerevan since its opening in 1992. The success of this effort has been used by the USAID as the model for the implementation of health care education in the redevelopment of the former Soviet Eastern European countries.